After a public hearing, Council supported our request to refer the bylaw back to Administration for reconsideration as an RF4 (semi-detached). The applicant has stated a desire to construct at least three units on the site. The community league looks forward to working with them and the surrounding residents on a design which allows for a gentle increase in density, without overtly impacting the surrounding properties. The Glenwood CL is requesting feedback on a rezoning proposed for the corner of 163st and 97th avenue. If you live in the immediate area or have an interest in redevelopment in the community, Please read the following information and send us your thoughts via the comment form. City Administration is proposing a large series of amendments to the Mature Neighbourhood Overlay (which establishes rules for the built-form of residential developments in mature communities) and a number of residential zones. The changes are being proposed as part of an implementation strategy for the Residential Infill Guidelines (policy passed in 2010 which lays out desired locations and guidelines for infill development, and multiple housing types. Some of the changes include loosening the restrictions on front-garages, giving development officers more discretion as to their location and design. Others include allowing duplex and semi-detached housing in certain locations under the RF1 zone. Which currently requires a rezoning to another residential zone (typically RF3 or RF4). Some information from the EFCL is available here, as well as dates for community workshops on the subject. Below are presentation materials from the city and the complete Council report showing mark-ups of all the proposed changes. We hope to have a more readable breakdown of the proposed changes available in the future. For now however, please give these a read, and contact us with your feedbank. Thank you. The City of Edmonton is interested in consulting with residents who bicycle commute regarding the system of on-street bike routes throughout the city. Banister Research & Consulting Inc. has been retained to assist with the gathering of feedback in the form of a focus group and the analysis of the responses. We are conducting focus group research in the evening during the week of November 12th to the 16th, 2012. Please forward this request to your members. Those interested in attending the focus group can contact Chris Stover at (780) 447-9017. We have limited space in the focus group; therefore people will be registered to attend on a first come, first served basis. If you have questions regarding the legitimacy of the research, please contact Pam Hnytka at 780-442-1507 or via email at pam.hnytka@edmonton.ca. 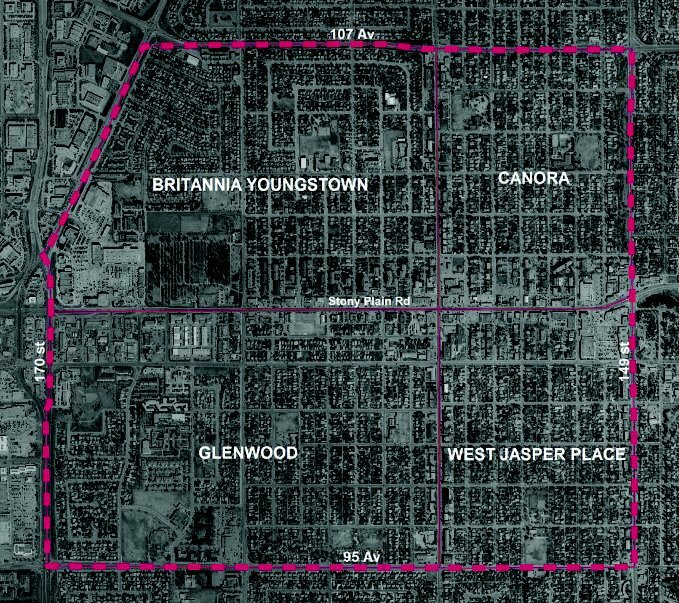 The City of Edmonton is embarking on an Area Redevelopment Plan process for the four Jasper Place neighbourhoods of Britannia-Youngstown, Canora, Glenwood and West Jasper Place, as well as a portion of the Stony Plain Road commercial corridor. The Jasper Place Area Redevelopment Plan (ARP) is an important planning document that will guide future land use and zoning decisions in your neighbourhood. As part of this process there is an Open House and we want you to attend! Learn more about the Area Redevelopment Plan process, tell us your priorities for the Jasper Place ARP and get your questions answered by City staff.